These cinnamon toast crunch roasted chickpeas taste just like the cereal. Made with maple syrup, coconut oil and cinnamon, they’re a much healthier way to snack. I feel like roasted chickpeas were super hot as a food trend back in 2012 when I originally wrote this post and recipe for cinnamon toast crunch roasted chickpeas. 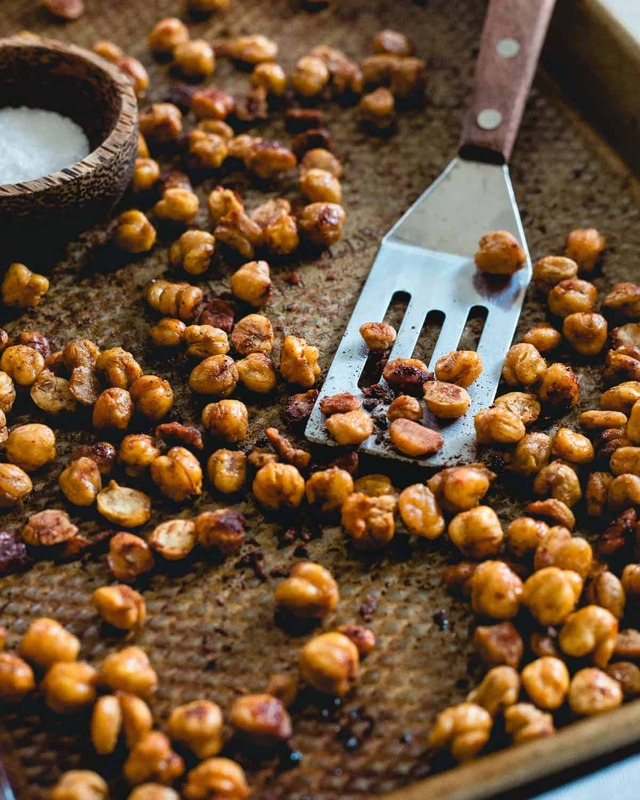 Evidence –> this recipe for spicy cinnamon roasted chickpeas published 2 months prior. I’m not saying they’re not as good these days but I feel like we’ve sort of forgotten about them as a snacking option as of late. Or, maybe it’s just me. Regardless, they’re back in my life and I figured what better time to re-do this recipe a bit. I was majorly into roasted nuts back in 2012 too – check out these spiced rosemary maple cider nuts for another throwback. I actually made a whole tutorial post and video (click that link on the title to read that post – I’ve included the video here in this post above as well) on the method I use to roast chickpeas. I’ve learned a thing or two in the last 6 years one of which is that the tediousness of peeling chickpeas is worth it…sometimes. In hummus? Not worth it to me – I don’t mind if there’s a little bit of texture in my hummus. For roasted chickpeas? Worth it – those peels can sometimes enable sogginess after roasting and ain’t no one got time for that in a roasted chickpea. Roasted = crispy and if you want crispy, you need to peel. It’s 10 minutes of your life (seriously, I set a timer to see exactly how long peeling a 15oz. can of chickpeas would take and it was 10 minutes and 24 seconds with an interruption of taking the tissue out of my dog’s mouth that she stole from the garbage). I’m telling you, it’s worth it. My brother would flip for these. He was the cinnamon toast crunch kid, I was the lucky charms one. We were not allowed to touch each other’s cereal boxes. It was like the one treat my mom let us have in the house from time to time and there was an unspoken understanding that we didn’t mess with the other person’s stash. 25 or so years later though thanks to Trader Joe’s knock off, I’ve developed quite the affinity for the tasty cereal treat (one of my favorite bedtime snacks to round out my macros for the day) and when I say these cinnamon toast crunch roasted chickpeas taste JUST like it, I’m not even exaggerating. I’ve also even made my own healthier version in this homemade cinnamon crunch cereal. Thanks to maple syrup and coconut oil though you can feel a little bit better about snacking on these instead of pouring bowlfuls of cereal from a box. In addition to peeling the chickpeas, this new method in the recipe tells you to let the oven cool with the chickpeas still in there, this really helps them crisp up and STAY crispy. Don’t skip that part either. If you don’t attack the whole baking sheet like Ulysses and I do and happen to have leftovers, the best way to store them to retain crispiness is in a paper bag, NOT a tupperware container. Hope you give these a try – happy snacking! Mediterranean roasted lamb – it’s a sheet pan meal with roasted chickpeas in the mix! Spread chickpeas out on a dry dish towel and peel skins off. This will take about 10 minutes, it's tedious but worth it for crispy roasted chickpeas that won't get soggy! Meanwhile, whisk together coconut oil, maple syrup and vanilla in a small bowl. 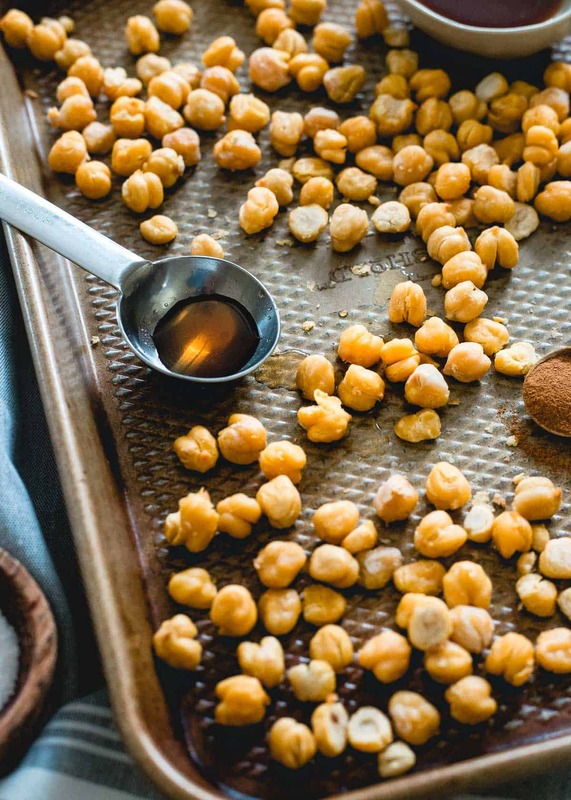 Remove chickpeas from oven pour the coconut oil mixture over top, season with the cinnamon and sea salt and toss to combine making sure all the chickpeas are evenly coated. Return baking sheet to the oven and roast an additional 12 minutes, tossing once half way through baking. Turn the oven off, open the door a few inches and let oven cool with the baking sheet still in the oven. 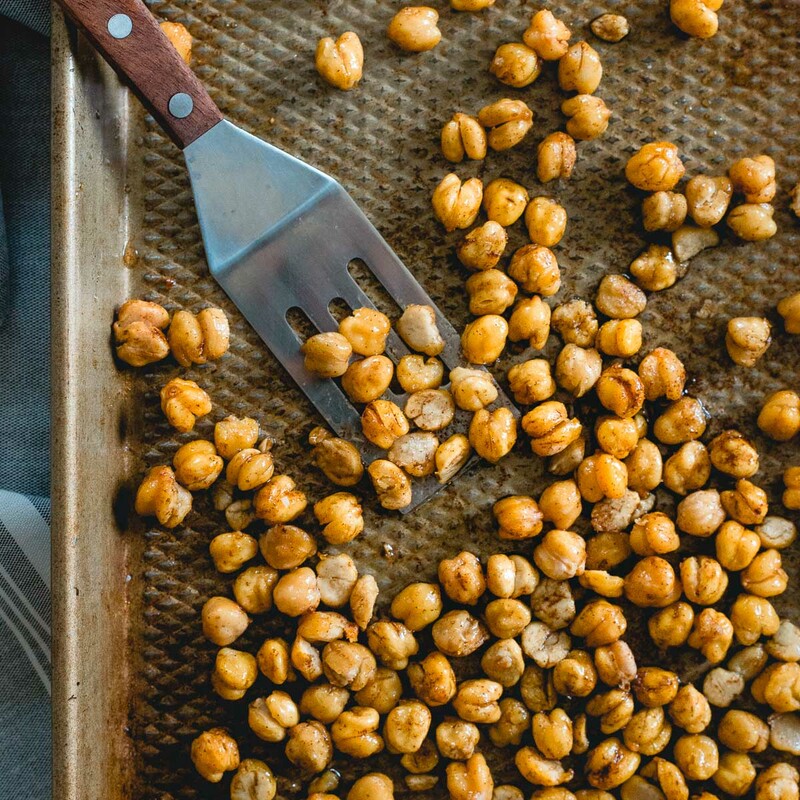 Once cooled, chickpeas will be crispy and ready for snacking! Store in a paper bag to retain crispiness but there likely won't be any leftover to do so! My brother was also a cinnamon toast crunch kid. I was more into cocoa puffs…anything with chocolate, really. I can’t wait to try this recipe! Going to go soak some chickpeas now! Second of all – those look awesome and I would like to be dipping my hand into that jar and grabbing fistfuls of it right now please. Thank you! haha, this post was written and scheduled while still sober before last night’s ridiculousness. Right now I’m nursing a hangover with some coconut water hoping I can get my act together enough soon to make 3 side dishes for Easter tomorrow! Okay, well I’m not glad that you’re nursing a hangover but I AM glad that that post was done well in advance…otherwise I’d feel pretty bad about myself and what I’m able to accomplish in life. Haha. Fabulous recipe!! I love roasted chickapeas they remind me of corn nuts, but way healthier! I sort of live by the saying- life is too short to make dessert out of beans, but these…. I could dig haha. after you tweeted about these yesterday, i couldn’t wait for the recipe! definitely making these this week! Cinnamon toast crunch was my favorite too! I love the beans for dessert idea haha. I’m not sure how anyone else will react to them, but I’m sure they’ll want to eat them up as soon as they try them. The chickpeas look so crunchy! i have been making dessert hummus lately and totally love it!!! These look amazing, can’t wait to try the recipe out!! This is probably the most unusual combination Chickpeas and cinamon: I’ve come across: I’m going to give it a whirl hough. Can’t wait. The trick to getting them crunchy is to make sure they are completely dry before tossing them with the tahini and cinnamon/sugar. So after you rinse & drain them, either dry them thoroughly with a paper towel or let them sit out and dry first. They won’t get as crunchy as a real nut but they won’t be soggy either. I’m not as cool as the rest of you guys. Is there anything I can use in place of Tahini? Cinnamon Toast Crunch and Cinnamon Life were my favorite cereals growing up!! I’ve made peanut butter roasted chickpeas before and they were awesome so I’m quite certain these would be right up my alley. haha, that show is like my worst nightmare! I would have a panic attack and totally freeze up! Gina, this is effin’ brilliant!! I’m so totally making these bad boys. They sound delicious! I’ve tried some other roasted chickpeas before, but this looks even better. Cinnamon and Sugar is a great idea! I can’t wait to try them out! How cool is this recipe! I wish I could be so creative. Great idea for a quick snack. Except I would substitute stevia for the sugar. WHOA!! I am a cinnamon FREAK! (And a chickpea lover). This looks amazing!! I am totally perplexed at what happened when I made these! I am trying to use dried beans instead of canned. (apparently using canned anything can cause cancer…along with everything else in the world) Anyways, I soaked my beans and they still didn’t seem as creamy as a canned bean :( I proceeded with the recipe, sort of ( I only used Trader Joe’s cookie butter, and chick peas and they weren’t crunch at all they were sort of mealy. The flavor was great though! Do you think its because I didn’t use the canned bean? HELP! I want to eat tons and tons of these asap! No worries, I will try again! I have faith. I just made these and they were awful! They weren’t sweet at all. Not sure what I did wrong but I just threw the entire batch in the trash. Jenny- sorry they didn’t turn out for you. I’m not even sure how it’s possible they wouldn’t have been sweet considering 2 of the 3 ingredients (besides the beans) are cinnamon & sugar. That’s really weird and hasn’t happened to me at all in the 3 times I’ve made them since this post. I had the exact same experience, no sweetness. Trashed. Thanks for the good recipe! I used dried chickpeas – had to stir them every 8-10 minutes for 45-50 minutes to get them nice and crunchy. I used half brown sugar and half white sugar. I added some salt as soon as I got them out of the oven to bring out the sweetness – delicious! And just in case anyone is wondering, these are better as a snack than with milk as a cereal – my dear fiance thought he was going to have the best breakfast ever this morning… not the case! ;) Haha! oh my gosh, I can’t believe he tried them as “cereal” haha! I know I named it after the cereal, but I never intended it to be eaten that way! Chickpeas + milk is kinda making me cringe right now. ;) Poor guy! Even though it is SO hot today, I am giving these a try. Using natural peanut butter because I am out of tahini. I made sure they were dry and removed most of the chick pea skins too so i think they will dry out a bit more. I also made sure to really spread them out on the cookie sheet so the moisture could evaporate. They are delicious. Im going to experiment with this as we are trying to switch to homemade cereal. Any idea how this recipie would freeze? I know somethings things loose there crunch when frozen think that would be the case? I honestly don’t think these would freeze well at all. Pretty sure they’d turn to mush after defrosting. Someone said they used dried chickpeas for this recipe. Would this work well and if so, how would you prepare them and how long would you cook them? I haven’t used dried beans before so I’m not quite sure. I’d assume you’d need to soak them and cook them first. These look great! How long would you be able to store them for? I’m planning to make a batch for snacks for my toddler. Thanks. a couple of days in an airtight container but honestly, they’re best (crispiest) served immediately. This is perfect alternative for popcorn xD. I’m thinking I would try it with a Coke ???????? 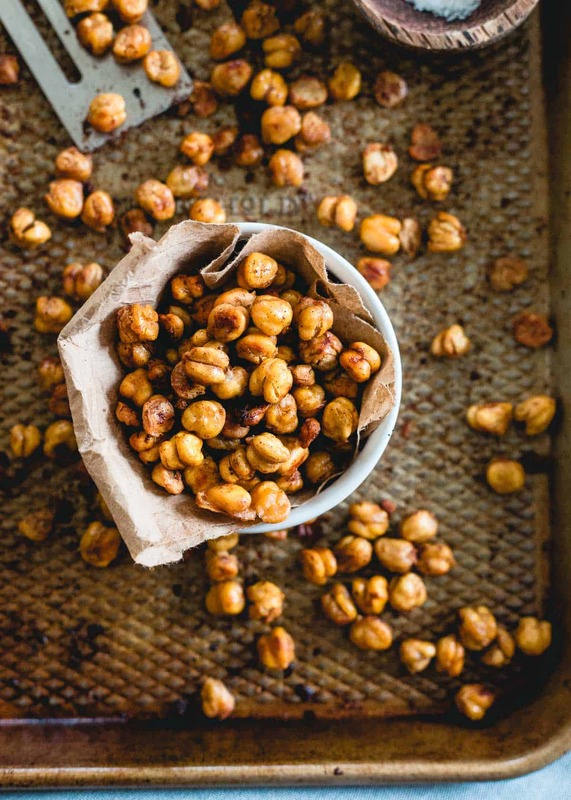 Good idea, I’ve always made roasted chickpeas with savory seasonings, but this sounds amazing! Please be more accurate with your chickpeas pealing! Took me forever to get them peeled, idk why you’d even say it will take 10 min. I literally timed myself doing it and it took me 10 minutes for 1 can.